This is a special event with our new Celtic friends from California! We’ll have a raucous good time and raise some funds for the Amazing Grace Food Pantry and our neighbors at St.Vincent de Paul Middletown. Besides for the incredibly lively music of Tempest, we’ll have games, food, beverages and fun! This event will be held in the beautiful space of Oak & Velvet Fine Upholsters at 180 Johnson Street. Plenty of free parking and lots of room to dance! If you need wheelchair assistance please call ahead. The last 27 years have seen Tempest release nine critically acclaimed CDs on Magna Carta, and play more than 2,000 gigs. 2016 will see Tempest continue touring and bringing their Celtodelic Rock to their established and new fans while supporting their new album, “The Tracks We Leave”, on Magna Carta Records. Tempest were inspired by a Dakota Sioux proverb on the “The Tracks We Leave”, which has triple references to the environmental, spiritual and musical tracks we leave upon the world we live in. 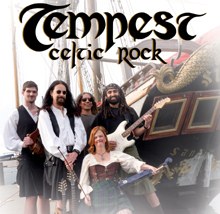 Since forming in 1988, Tempest has delivered a hybrid of high-energy Celtic Rock. But as the band has matured throughout the years, their music has morphed stylistically. World Music has seeped into Tempest’s over all sound because the band members are drawn to traditional and ethnic music from around the globe. There has been a natural progression towards coloring Tempest’s music with elements from Scandinavia, India, African and Arabic countries. Middle Eastern flavors, traditional Irish and Scottish Medleys mingle with Robert Burns poems, Norwegian lyrics and heavy rock instrumentals on Tempest’s finest record to date.